Our NEW borders are perfect for both your lanscaping and playground needs. Neetly contain your rubber mulch with these convenient borders. Pick and chose to create your own customized yard with easy and efficiency! Our NEW borders are perfect for both your landscaping and playground needs. 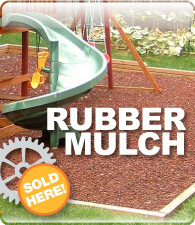 Neatly contain your rubber mulch with these convenient borders. Pick and chose to create your own customized yard with easy and efficiency! The New FlexiStack Border System is made from recycled rubber, is environmentally friendly, and offers a sturdy, safe and attractive look to any landscape or playground area. Designed with a patent pending inter-locking system, the borders create a “seamless look” allowing you to form the shape that best works for your landscape. The borders are also flexible rubber allowing graceful curves that will keep your mulch in place and even reduce the amount of mulch needed. They are also stackable to handle varying heights of uneven landscapes, gardens and playgrounds. Each border's overall dimensions: 48" long x 4" wide x 4.5" tall. The linear length is 42". Available colors: Black, Brown, Green, Red. Suitable for both Playground and general landscape use. Flexible Borders allow you to shape your play area with bends and curves, and still keep your play area surface tidy and contained. The curved rubber borders offer safe, attractive and kid friendly alternative to wood timbers.